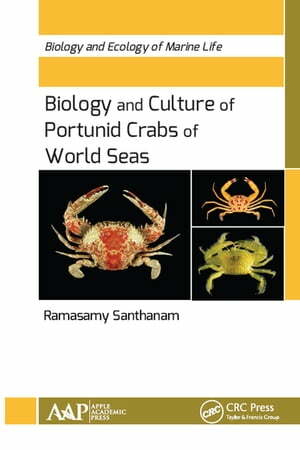 Collins Booksellers - Biology and Culture of Portunid Crabs of World Seas by Ramasamy Santhanam, 9781351795142. Buy this book online. Biology and Culture of Portunid Crabs of World Seas provides an abundance of valuable first-hand information about the diversity, biology, ecology culture of the portunid crabs of the word seas. Marine crabs play an important role directly or indirectly in the livelihood of millions of people around the world. They have been reported to make up about 20% of all marine crustaceans caught, farmed, and consumed worldwide. Among these marine crabs, portunid crabs or swimming crabs of the family Portunidae (Class: Crustacea; Order: Decapoda; Infraorder: Brachyura) assume greater significance in the marine industry owing to their delicate meat with nutritional qualities. Although, several species of portunid crabs are edible and commercially important, only a few species of Scylla and Portunus have been widely cultivated. This is largely due to the lack of information on the biology of portunid crabs. Keeping this in view, this new volume presents the biology and aquaculture of marine portunid crabs. This volume will be of great use for researchers and students of disciplines such as fisheries science, marine biology, aquatic biology and fisheries and zoology and will also serve as a standard reference for college, university, and research libraries around the world.